On Friday we brought you an update to the story of Sherwin Shayegan, the inveterate piggyback bandit, who's spread his terror throughout the northern United States over the past several years. He assumes a variety of disguises—benchwarmer, reporter, fan—and then jumps on the backs of high schoolers everywhere. 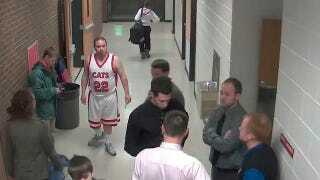 Deadspin intern Dave Shireley once attended a high school in North Dakota which Shayegan is accused of visiting. He's spooked. Shayegan also popped up at a college basketball game, St. Olaf against Concordia, in Minnesota late last week. He gave the players water, but there is no evidence he attempted any piggyback rides. Nonetheless, he's been banned from games in Minnesota. Our instinct would tell us that Shayegan, whose whereabouts are unknown, is working his way east and might soon be in Wisconsin or Michigan's upper peninsula. We'll keep you apprised of future developments.